How to Properly Sort and Organize Your iTunes Library – Sanspoint. Maybe it’s because I spent many of my early years in libraries, or maybe it’s because I’m just wired a certain way, but I find the way iTunes organizes music, out of the box, infuriating. The default way iTunes alphabetizes everything throws me off. Take artist names. I learned from an early age that when dealing with any form of media, you alphabetize based on the last name of the artist. So, if you’re dealing with albums by Elvis Costello and Elvis Presley, you would sort the former under “C” and the latter under “P”. Instead, iTunes sorts both under “E”. An even more egregious example is bands whose names start with “The”. Definite articles, in any language, are ignored with alphabetizing anything. Otherwise, you have a huge stretch of a music library of just “The” bands: The Beatles, The Clash, The Doors… which makes finding things a pain. Fortunately, iTunes added a feature back in version 7 to make this sane: Sort Tags. It’s possible to now set how you want an artist’s name to sort. By default, iTunes, since version 7, ignores “The” when sorting artists and albums. You can also assign a sort tag to an artist so that it places them last name first. 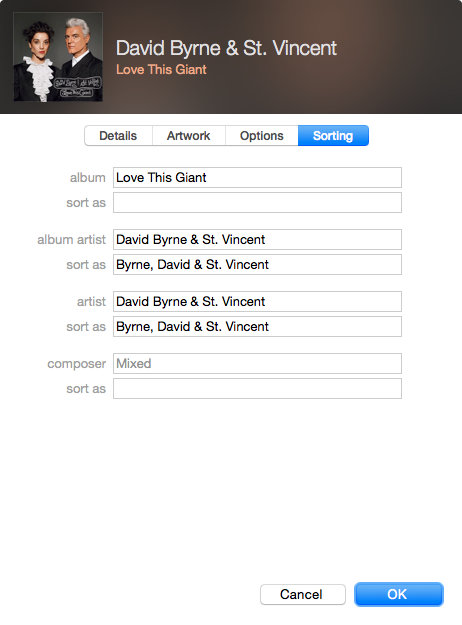 So, the first thing to do if you want your iTunes library organized and sorted properly is to set your sort tags. Any artist known by a first and last name (even a stage name) is assigned a sort tag in my library in the format “Last name, First name”. A trickier problem comes if you are a fan of any band or artist that’s released material under multiple band names. If you’re a fan of Frank Zappa, you might understand the issue well. Some of his material was released under the band name “The Mothers of Invention”, some as just Frank Zappa, some as “The Mothers”, some as “Frank Zappa & The Mothers of Invention”, and at least one as “Zappa / Mothers”. Enter the Album Artist tag. 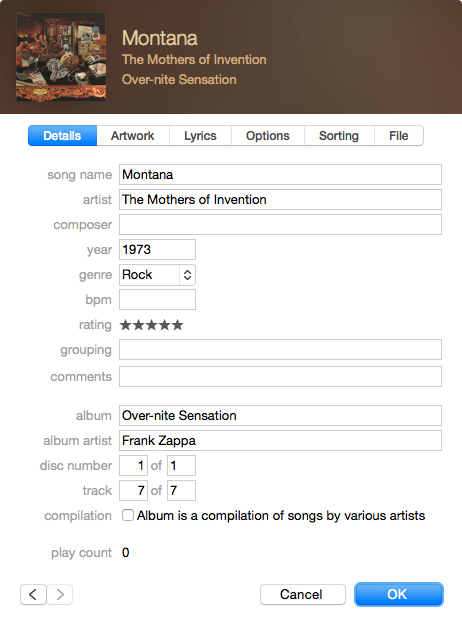 You can set different values in these tags, so by assigning Album Artist the value of “Frank Zappa” (sorted as “Zappa, Frank”), and Artist as “The Mothers of Invention”, all my Zappa albums appear together, but the artist value is correct for playback and tracking in Last.fm. The trickiest of all problems is how to deal with joint albums, say David Byrne’s collaboration with the amazing St. Vincent. I found an easy solution by assigning the joint act’s name to the both Artist and Album Artist fields, and sorting by the last name of the top billed artist. I’m flexible on solutions for this one, but keep in mind that standard alphabetization practice is always based on the name that comes first. You’re now most of the way to a properly organized and sorted iTunes library. There’s one more change you’ll need to make, however. 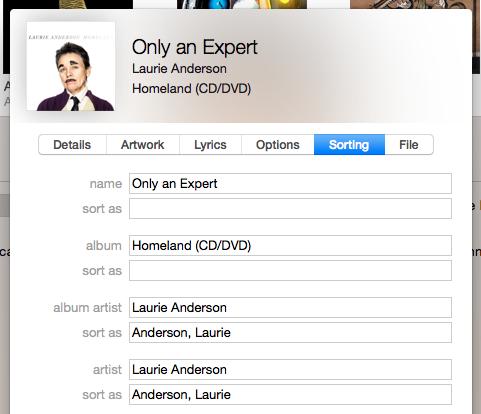 By default, iTunes not only organizes artists alphabetically, but also albums. This is a no go for me. I organize all my albums by date of original release, and so should you. This one’s easy to fix. 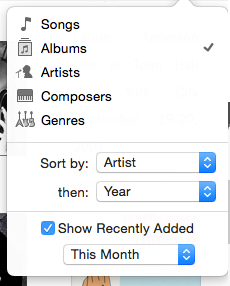 Click the drop down at the top-right corner of your iTunes window and set the “Sort by” drop down to “Artist” and the “Then” drop down to “Year”. You’ll then want to go back through your library to make sure the dates on your albums are set to the correct year—the year of their original release. If you don’t want to do this manually, the free MusicBrainz Picard Mac app is a great solution for cleaning up your tags automatically. Even if you bought all your music from iTunes, it’s worth running it through Picard, because iTunes releases often assign the date to the year it was released on iTunes, and that helps nobody. That’s all you need to do. Get proper album artwork, either from iTunes or Album Art Exchange, and then you can enjoy your music, organized properly, like a civilized human being. Sort Tags, and Album Artist transfer to iOS devices , so your artist views will be properly organized, though you’ll also need to switch on “Group By Album Artist” in the Music section of settings. Sadly, iOS devices don’t allow you to sort albums by year within an artist view, but my iOS replacement music app of choice, Cesium, does. It’s worth the $1.99 for the peace of mind.